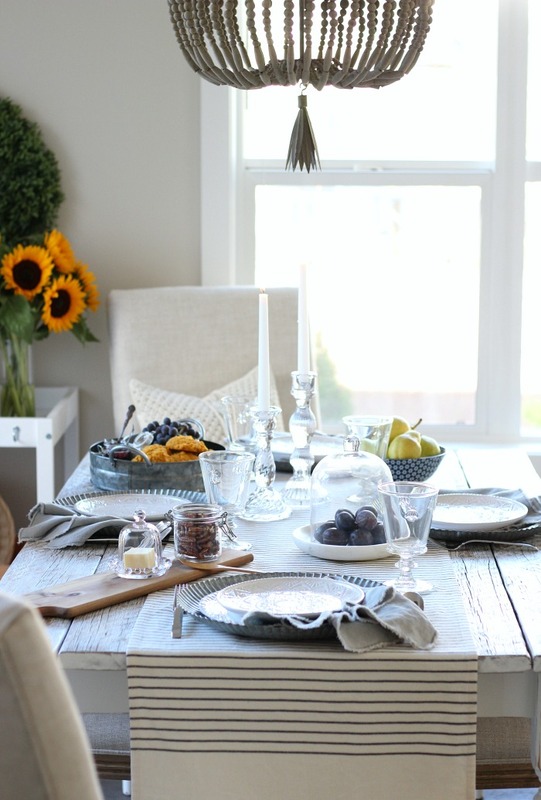 Get inspired as Canadian home bloggers share their best fall decorating ideas, including our kitchen tour and tips for setting a french farmhouse style table. 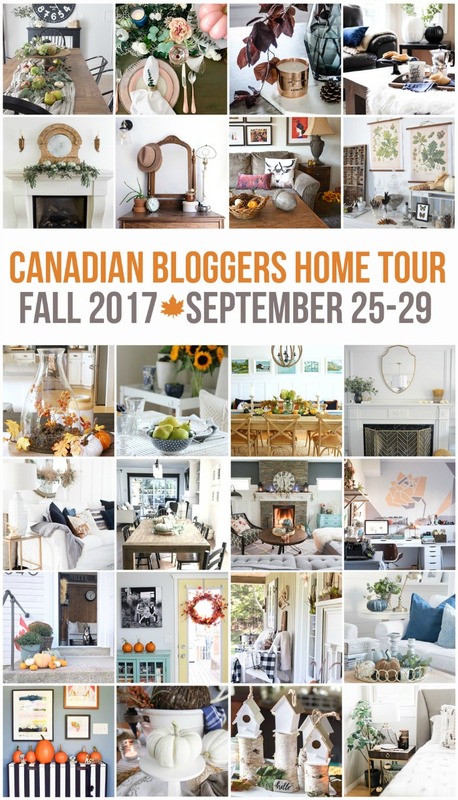 Hello, and welcome to Day 3 of the Canadian Bloggers’ Fall Home Tour. Once again, I must thank Christina and Shannon for being our gracious hostesses, as well as 21 other blogger friends who have been very busy adding touches of fall decor to their spaces to welcome this beautiful season. Before we begin, may I suggest grabbing a hot cup of coffee or tea. Maybe a pumpkin spice latte? If you’re like me, you’ll want to settle in and soak up every last drop of these lovely autumn decor ideas. 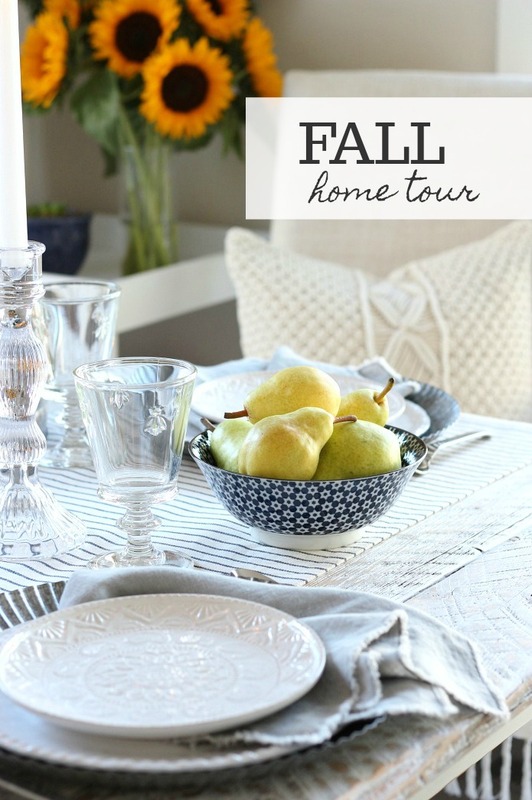 Links to each fall home tour are located at the bottom of the post, so be sure to check them out as they unfold all week long. Some of the links in this post are affiliate links, which allow me to make a small commission from your purchase without an additional cost to you. Thanks for your support! Until we find that place, our current home is where I have fun playing around with different styles. 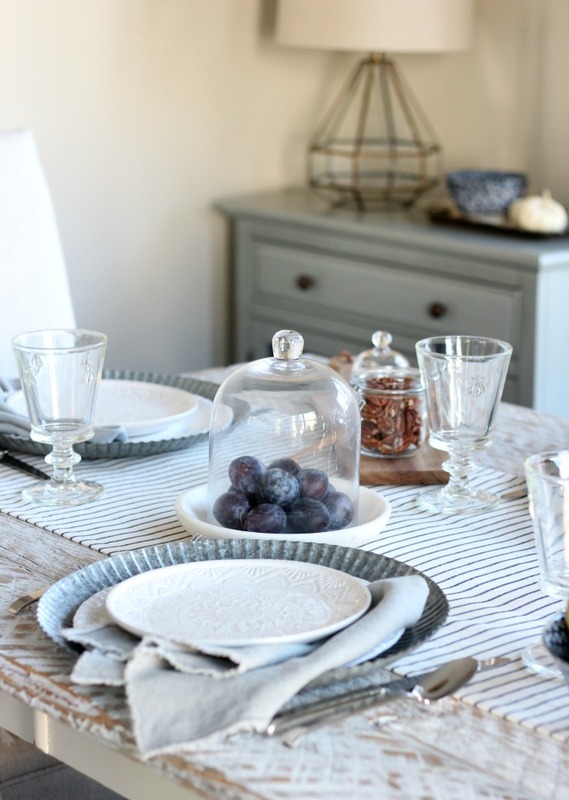 Take this french farmhouse inspired tablescape, for instance. 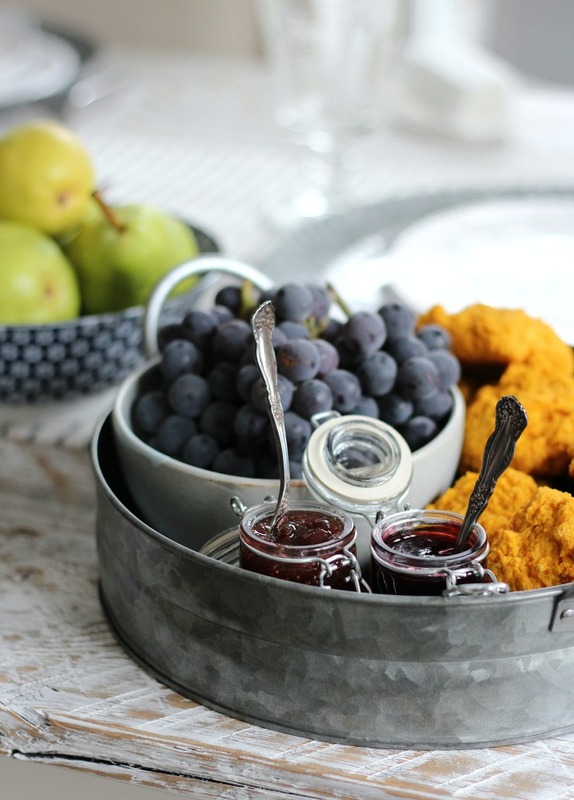 Last fall, I mixed vintage decor with some new pieces to create an eclectic fall table setting. This time, I envisioned Sunday brunch in the beautiful fields of Provence. A girl can dream, right? 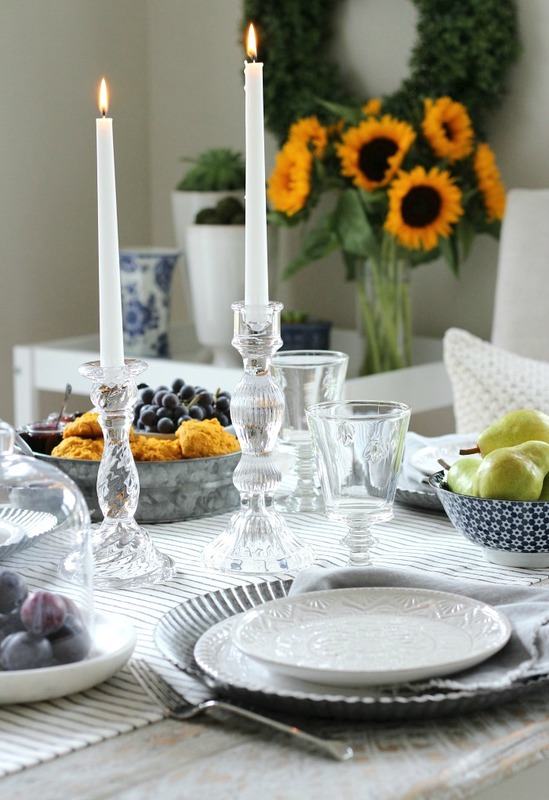 Of course, I always like to use what I have on hand and only picked up a few new decor pieces like the embossed salad plates, french linen napkins and glass candle holders. They’re staples that can be used down the road too. 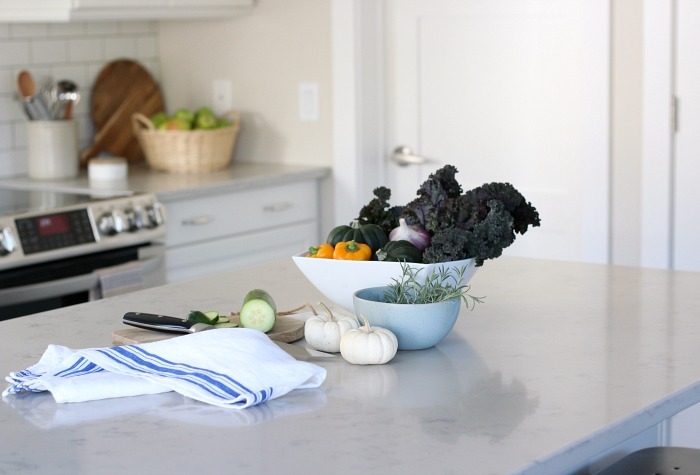 It’s amazing how simply adding fresh seasonal flowers and produce drastically changes the look of a space. Fall started out a bit dreary here, so naturally, I gravitated to these bright and cheery sunflowers. They’re a total mood booster, aren’t they? Most times, that’s where my use of seasonal colour comes in. I’m basically back to a blank canvas of neutral layers and textures once they’re taken away. Of course, I couldn’t resist adding a bit of a boho touch with this fabulous macrame pillow. I already warned my family there’d be no pillow fights with that one. Have you tried any DIY macrame projects of your own? I think you’ll spot at least one or two as you go through the entire tour. 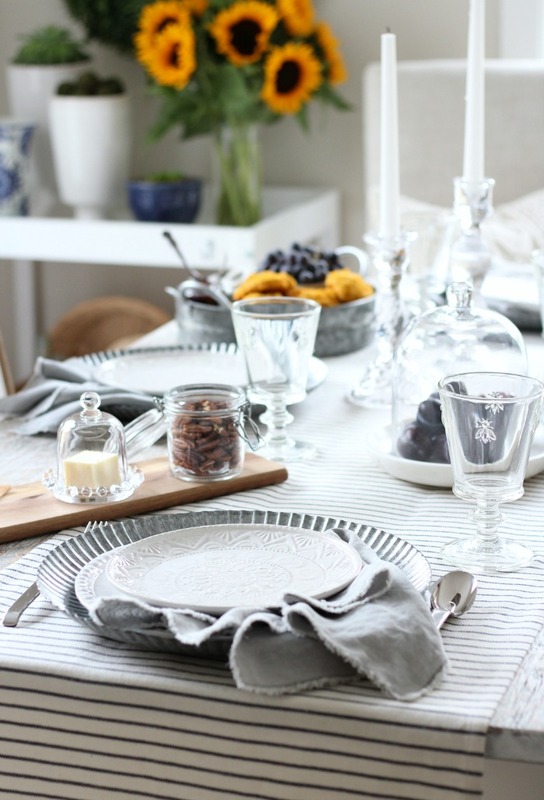 Glass and metallics are another way to add interest to a fall table setting, especially when it comes to candlelight. I tend to use candles any time of day. Right now, they remind me of a gorgeous autumn sunset. It doesn’t get much better than that, right? And, in the evening, our beaded chandelier gives off an amazing glow. It makes the shorter days better. Know what I mean? I was happy to finally be able to unpack the rest of our dishes we had stored in the basement from the renovation. Only two years later (ha), but it took a while to find the perfect cabinet for this tiny corner in our dining area. The satin brass and glass lamp was a recent find too. It provides the additional light we need this time of year and speaks to the vintage-style sconce that’s above our kitchen window. It’s the subtle details that tie a space together. I set this table with Thanksgiving brunch in mind. It’s less than a few weeks away for us Canadians. Although we’ll be heading to the farm to meet up with our families, we may host a Friendsgiving celebration this year. Fall is my favourite time to entertain. Care for a pumpkin spice scone? They’re delicious with a bit of homemade blackberry jam on top. Yum! Or, maybe you’d prefer a pumpkin spice cupcake instead? On that note, let’s head to the kitchen. I didn’t switch things up too much in there except for adding some new plants and a bit of rearranging. We were at a vintage market over the weekend and I spotted these kale roses. Aren’t they fun? The succulents were on our front porch all summer long, so they’ll live on our kitchen island over fall and winter. They tend to do well with all of the natural sunlight we have coming in through the big windows at the back of our house. As always, I included some thrift shop finds, like the silver tray, chinoiserie cup and saucer, as well as the natural woven basket. Shopping secondhand will save you big without compromising style. Have I mentioned how much I LOVE having a bright and cheery kitchen? It was even overcast the day I took these photos. 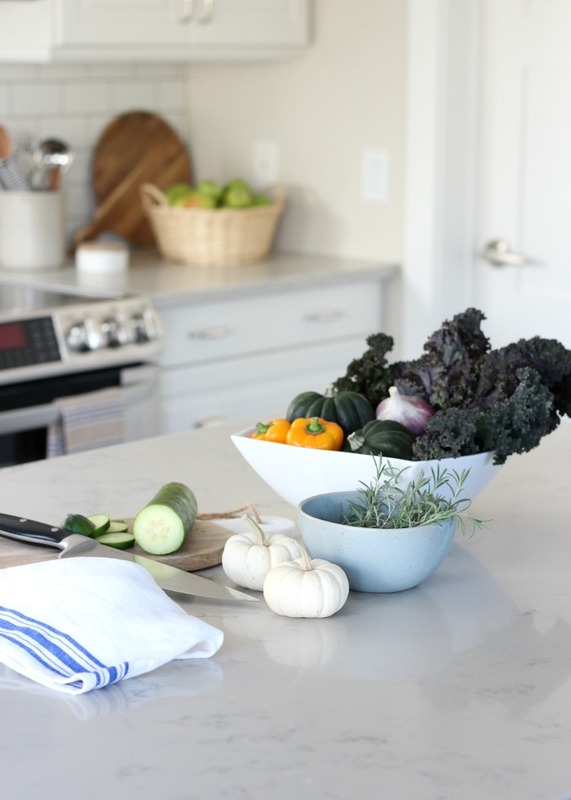 With all of the gorgeous fall produce available right now, I find myself wanting to cook more meals from scratch. Over the weekend, I made red kale chips for the first time. They were delicious! This week, I have stuffed squash and roasted cauliflower mac & cheese on the menu. Good ‘ol comfort food with a healthy twist. It’s another part of fall I enjoy so much. 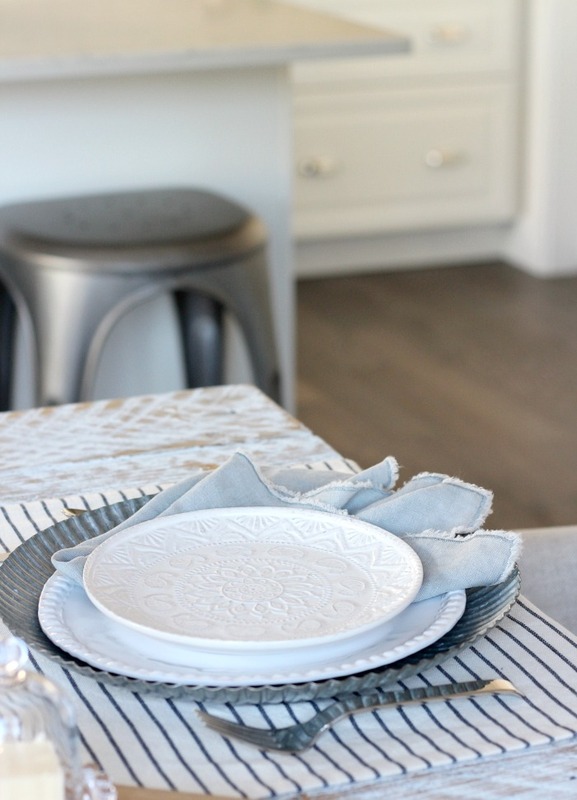 Now that you’ve taken a little tour of our kitchen and dining area, it’s time to send you along to see what my Canadian blogger friends have been doing to get their spaces ready for fall. While you’re there, say HELLO. I hope you’ll be back soon to check out more projects I’m working on! Before you head out, I invite you to SUBSCRIBE to get more decorating ideas like these delivered straight to your inbox. 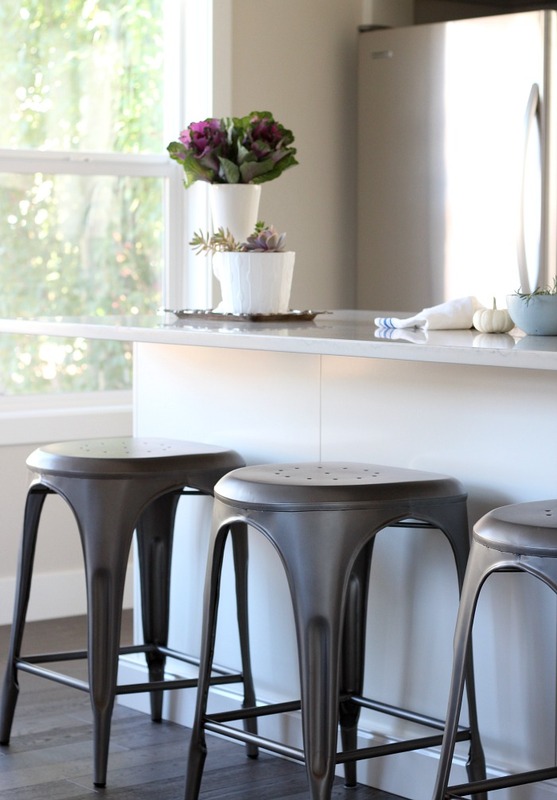 I’d love for you to join our growing community of home & garden enthusiasts! Yes I do care for a pumpkin spice scone actually! Haha. And I want to eat it in your lovely, calm kitchen. Everything is beautiful. 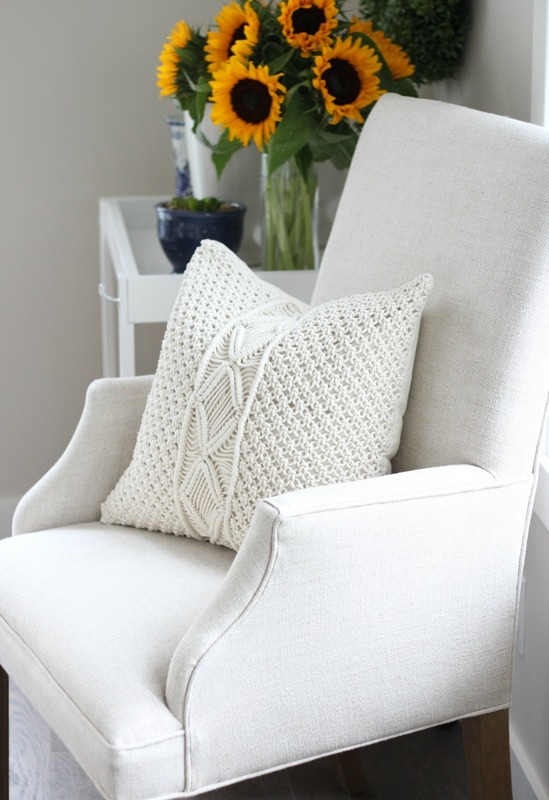 Loving that macrame cushion! No pillow fights, hehe. My issue with cushions is the dogs. They love to get their heads on any new cushion right away. Okay, it’s on its way (ha ha)! I get the dog thing. I didn’t invest in a nice area rug or drapes in our living room for that reason. Now that we’re dogless (God rest her soul), I’m decorating a little differently. Although, lately, I’m the accident prone one who seems to be damaging things! Everything looks beautiful! 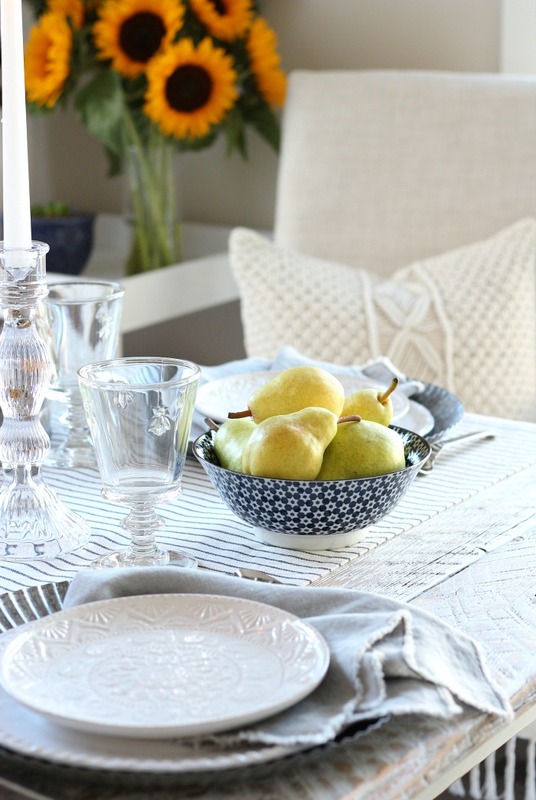 I love that tablescape and your new dishes and linens! Good find on the table runner too. I’d love to join you for a pumpkin scone! Thank you, Jennifer! I love those good thrift shop scores. And anytime you’re in my neighbourhood, let me know. I’d love to get together! Wait…you have scones?! I’m in! haha. Seriously though, your space is glorious. All the white and clear glass gives it such a light dreamy feel. So lovely Shauna! You have such a calm and lovely home Shauna! I’d love pop over for a scone and maybe sneak out with that gorgeous macrame pillow! ;) Beautiful fall home! Come over anytime (after I get the security cameras installed- lol)! Oh your home is just so beautiful and calm. I’d love to pop in and sit at that welcoming table and share a cup of tea and one of those delicious scones. Thanks for a bit of beautiful fall eye-candy today. Gorgeous, Shauna!! 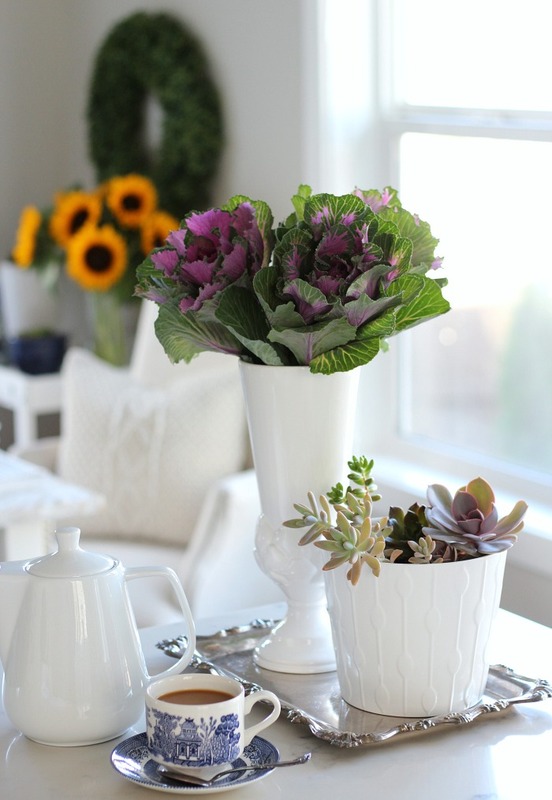 Those kale in the vase are adorable – such a brilliant idea. They are one of my fall favourites!! 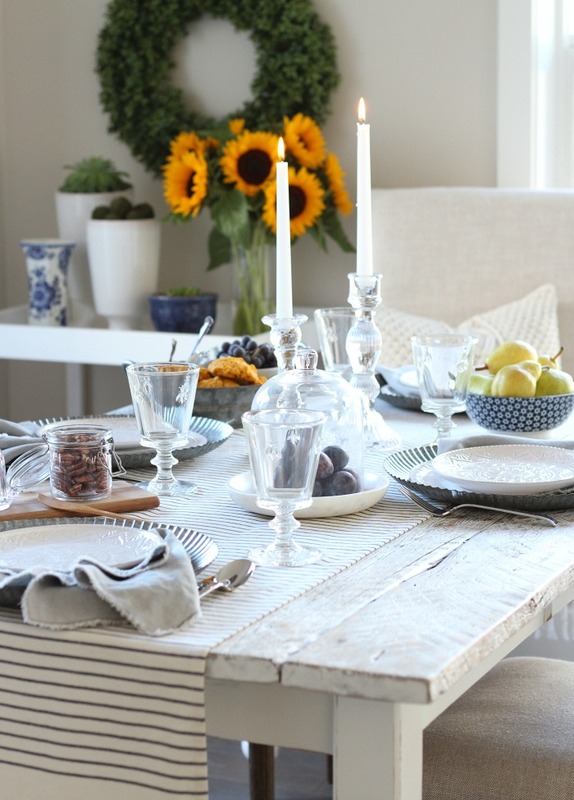 Such a lovely tour – beautifully styled and photographed! Thank you, my friend! I can’t believe how long they last, too! Beautiful Fall table. I love all the texture in the different elements of your design. I also really like the sparkle of the clear glass pieces–the bee goblets are adorable! What a beautiful space Shauna! 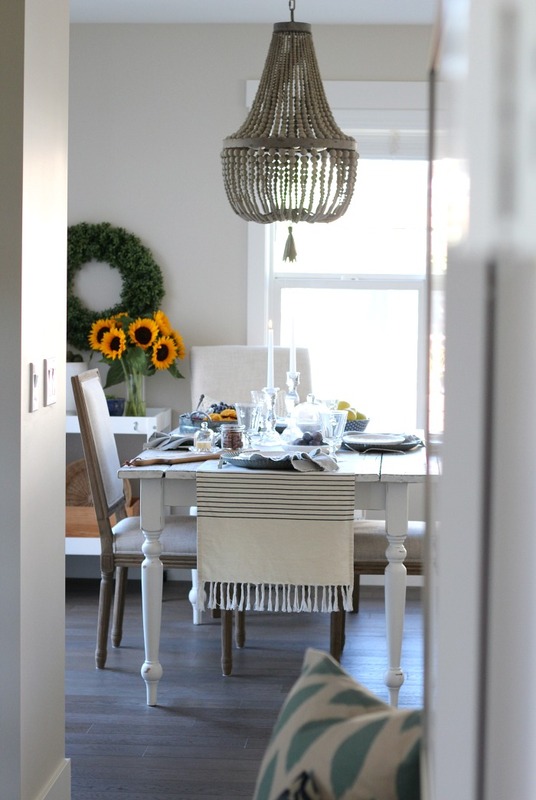 The sunflowers and fresh veggies make this space so cheerful and inviting. Shauna everything is so pretty! I love your French country day dream. And that chandelier is amazing! Thanks, Dannyelle. It was fun to imagine for a bit anyway! This is simply gorgeous, Shauna! 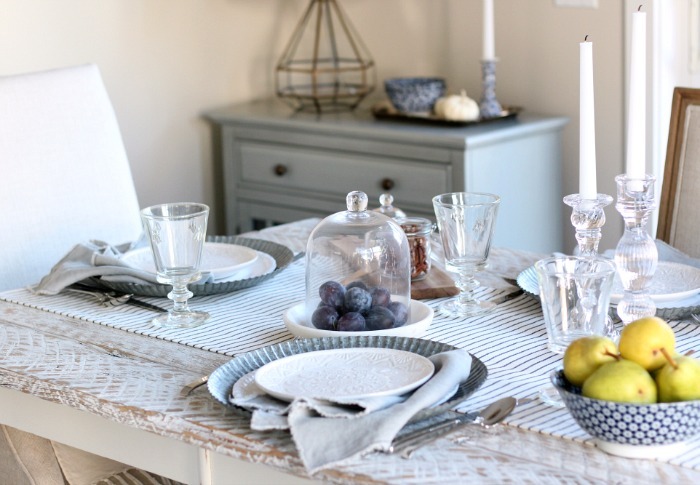 It definitely has the perfect French Country vibe – love the linen napkins, cheery colours and natural textures. 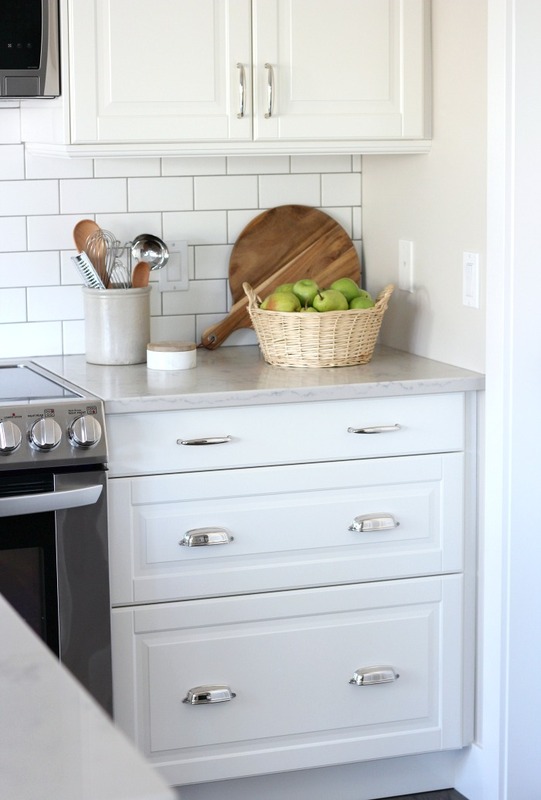 You do food in a home tour so well! I love how good and how natural it all looks. Marvellous! I even spot a few little touches of blue, love! 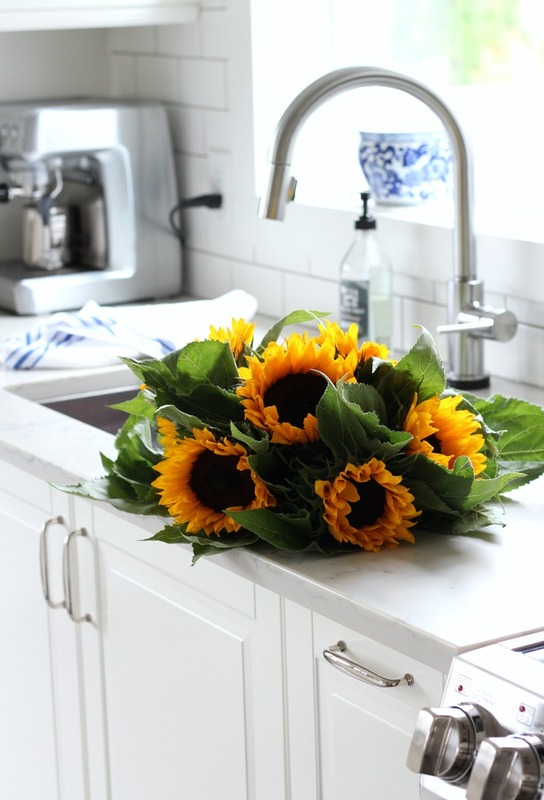 I agree, sunflowers are a total mood booster and they look absolutely beautiful in your home. It’s all so lovely, thanks for letting us stop by! And good luck finding that dream home of yours. This is gorgeous, Shauna! You’re looking for a new home?? How exciting! I hope you have a great search. In the meantime, I always enjoy your beautiful tours. Thanks, Jamie! Yes, we’ve been driving the country roads scoping out land and homes for sale. We may have found a contender. Eek! 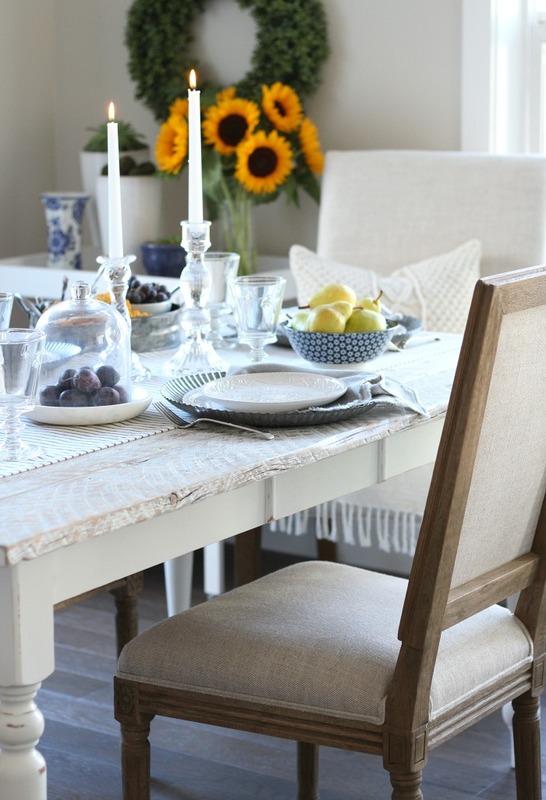 Love the linen and cozy yet light feeling of fall you bring in this post!